One of the Nation’s Hottest Nightclubs Reveals its New Friday Night Event Series on March 9 at 9:00 p.m. Shadowy seductive spirits are descending upon Ivy Nightclub at Andaz San Diego. 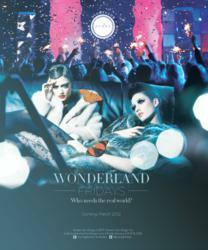 The epicenter of San Diego nightlife, the hotel is reinventing Friday nights with its new entertainment series, Wonderland Fridays Presented by Fortune Industries. Set to launch March 9 at 9 p.m., Wonderland Fridays recreates an ethereal fantasy world once known only through the lens of imagination. Dapper Gents and Luscious Ladies: Smartly-dressed mixologists will stimulate tastes with handcrafted cocktails poured with a twist of sensual charm. Hostesses in flirty black dresses and lacy masks will tease the eyes alongside enticing cocktail servers dressed in black, slinky and lacy custom couture. Pop-Up Performances: The alluring dancers of LipStik, Inc. will coax spectators to the fantasy underground nightclub scene with 30-minute theatrical installations in the Ivy Wine Bar. For their first performance, they will stage an unconventional tea party with lustful undertones, leaving guests wondering what else awaits them down below. Hypnotic Beats: Popular DJs will entrance nightclub goers with their musical mixes on March 9 with sets from Fishfonics, Chris DeVoy, Theron, Este, Chris Liosi with Jason Whitmore on Sax and DJ Hixxen. To reserve a spot on the guest list, visit http://www.ivyentertainmentsandiego.com. For bottle service inquiries, please call 619.814.2055. Andaz San Diego is an urban escape known for friendly and uncomplicated service, sophisticated design and unpretentious style. Located in the heart of the Gaslamp Quarter, the cornerstone of the property is a 159 room hotel with 17 suites, each with custom fixtures and amenities, flat panel televisions and generously sized glass-enclosed bathrooms. Guests can enjoy complimentary welcome beverages while being checked in via handheld PC as well as complimentary amenities such as wireless Internet, local phone calls, and a mini-bar with non-alcoholic beverages and snacks. A center of dining and nightlife, Andaz San Diego also offers the Ivy Entertainment experience including the Ivy Nightclub, Ivy Wine Bar and Ivy Rooftop, a sultry rooftop bar and lounge with stunning skyline views, pool and private cabanas. Now open at Andaz San Diego is Katsuya by S+arck by sbe Entertainment Group, a celeb-favorite eatery featuring modern Japanese cuisine and innovative cocktails. Additional amenities include 10,000 square feet of flexible meeting and function space. For more information about Andaz San Diego, visit http://www.andazsandiego.com or call 619-849-1234. Like or follow us on Facebook and Twitter for the latest on hotel announcements, event calendars, special offers and more.